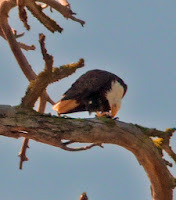 Bald Eagle at Prosser Creek Reservoir. The public is invited to participate in the 32nd annual midwinter Bald Eagle Survey on Friday, January 10, 2014. There are 26 survey stations surrounding Lake Tahoe where the birds will be observed and counted from 9:00am until noon. Most of the stations are on the beach with easy access. The count is coordinated by the Tahoe Institute for Natural Science (TINS), a nonprofit conservation, education, and outreach organization. The Lake Tahoe count is part of a National Bald Eagle Survey that was initiated by the National Wildlife Federation in 1979. The U.S. Army Corps of Engineers is coordinating the current national effort. The results of the count will be combined with all areas to generate an estimate of the Bald Eagle population across the U.S. If you would like to participate in the Tahoe survey, RSVP to Robin Jones at robin@tinsweb.org or 775-298-0066. You will need internet access to download survey forms and have a spotting scope or binoculars.